I came up with this recipe the first night we were in our apartment in Malmö. Our shipment of furniture and household goods still hadn’t arrived from the U.S. yet (after 5 weeks) and I was looking for an easy fix to make for dinner, but something a little bit special since it was our first night in our own place in Sweden. We had borrowed only basic cookware, plates, etc. from my in-laws so something complicated wasn’t an option. I had my sights set on some kind of creamy, seafood pasta when I found the crawfish tails in dill brine. I didn’t have any of my recipes with me so it was a wing-it-based-on-previous-experience moment. The result has become one of our family’s favorite meals. If I ask my 4 year old what she wants for dinner this is usually her choice. It’s simple to prepare on a weeknight, but also good enough for company. I love the contrast of the spinach pasta with the orange crawfish tails. 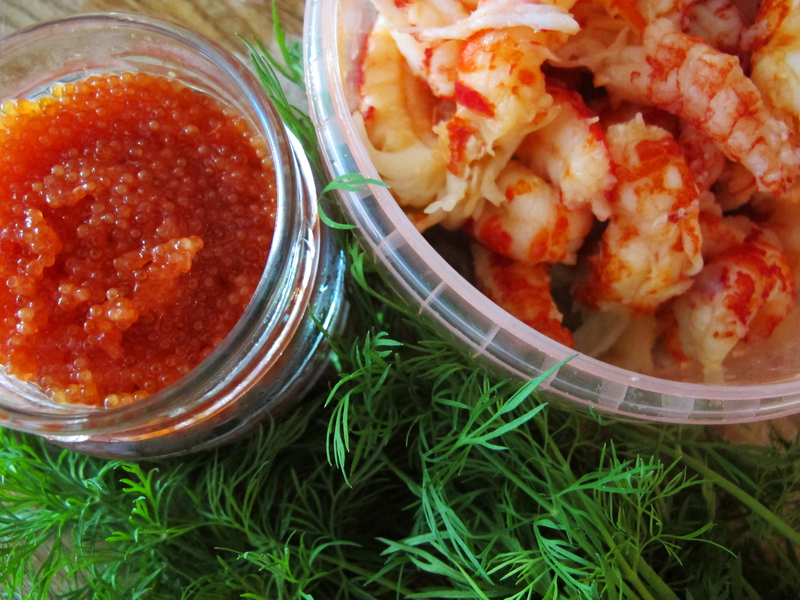 I don’t know how easy it is to find crawfish tails in dill brine outside of Sweden, but you could skip using some of the brine in the sauce and use whatever crawfish tails you can find. 1. Bring a large pot of salted water to a boil. Cook the pasta according to package directions and drain. 2. While you are waiting for the water to boil and the pasta to cook, start the sauce. Melt the butter in a large saucepan over medium-high heat and sauté the onion until translucent and soft, about 5 minutes. Add the white wine and let cook for a minute or so. Add the reserved crawfish brine, cream, and bullion cube. Bring to a controlled boil and stir occasionally until the sauce thickens, about 3-5 minutes. 3. Remove the sauce from the heat and add the parmigiano reggiano, crawfish tails, dill, caviar, and a squeeze of lemon juice to brighten everything. 4. 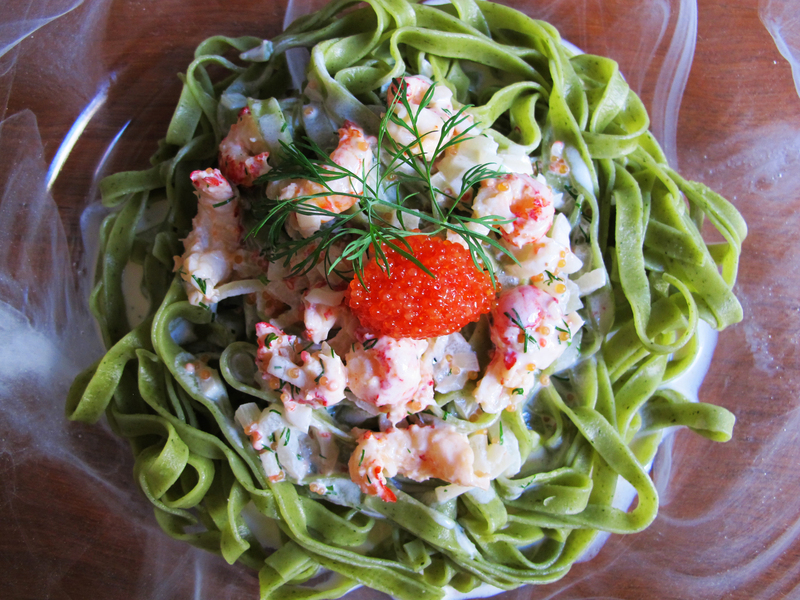 Serve the crawfish sauce over the spinach pasta and garnish with additional caviar and dill sprigs. Serve immediately. Thank you so much. Stop by any time. What part of Sweden are you from, and what is hour partner’s blog address? I’d love to check it out. I never would have thought of crawfish being a Scandinavian delight it does look delish!